The Pro Evolution Soccer series has been playing catch-up to EA Sports' FIFA games in this console generation. While the series has its bright spots that undoubtedly challenge the safer gameplay approach of FIFA, the Pro Evo series has lacked that "homerun" feature (pardon the baseball pun). Pro Evolution Soccer 2013 doesn't alter that course, but it brings forth some noteworthy updates that make it a viable means of getting your soccer fix. 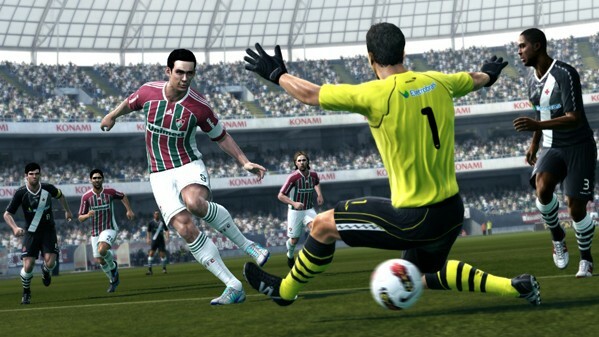 Of those updates, a group of gameplay changes that Konami is labeling "Pro Evolution Soccer Full Control" stands out. Included in this cluster of improvements is dynamic first touch, which focuses on moments when players anticipate a pass coming their way. This year, players can now trap or immediately flick the ball in the air to change its trajectory and set up for successive moves during first contact with the ball. It takes considerable time to get accustomed to pushing the right stick down to perform the flick move with accurate timing when using dynamic first touch controls. Even so, combining that with left stick player movement ends in players popping the ball in the air after receiving a pass and performing a beautiful sombrero move, lifting the ball over a defender. It sounds cool, and looks even better in the flow of the action. I found that it's easy to misjudge the precise moment players are trapping the ball, making the first touch controls difficult to execute. Leaving players with such a narrow window of time to successfully make use of these controls seems a little counter-intuitive. Worse yet, the training challenge in which players learn the move doesn't tell players if they hit the button too early or too late, which adds to the frustration of every improper execution. Still, once you get them down, first touch options like these don't just add to the flow of the game, but ultimately build on the beauty of the sport's depiction in Pro Evo 2013. The real full control options return this year via the left trigger, which offers players the ability to aim where they pass and shoot the ball without locking it to the direction of a teammate. The improvement here is the inclusion of an arrow icon that points in the passing/shooting direction, which swivels 360 degrees around the controlled player as the left stick is rotated. This makes full manual-style passing a more attractive option on the pitch, and quickly became something I worked in to my play style. For those that don't like the immersion-busting arrow hanging out in the midst of the action, the manual guidance indicator can be turned off in the options. For all the great additions that PES full control brings in Pro Evolution Soccer 2013, it also suffers from being too complicated for my tastes. For example, dynamic one-two passing has players holding the left bumper, passing to a teammate (A button), then using the right stick to choose which direction to send the first player running before tapping another button (Y) to pass the ball back to that first player. It's an interesting tactic I would happily employ in a match if I could ever get it to work, but my attempts usually resulted in an interception. Dynamic one-two passing, for how simple the result is in terms of the sport, feels like an impossible-to-manage fighting game combo on the controller. More often than not, the first player doesn't go where I attempt to send him. The trapping and dynamic one-two passing mechanics represent something that doesn't click with me in Pro Evolution Soccer: the game sometimes feels complicated for the sake of being complicated. While the soccer fan in me enjoys being able to deftly execute some of these more impressive moves on the field, the player in me shouldn't have to jump through hoops to pull off moves that are comparatively less impressive. Between the game's physical manual and the in-game performance training regimens, I could definitely spend hours mastering every nuance of Pro Evolution's control methods before feeling like I was even an adequate player. It's just not something that interests me, so accessibility in this year's game doesn't feel particularly improved. Again, this doesn't span the game's entire on-field control offerings, as there are plenty of moments where control feels natural and less jarring. The game's AI is more helpful this year, as it has been tuned to respond more realistically in different situations. The excellent off-the-ball controls used to manually guide attacking teammates return this year, but I found myself relying on them less as players felt a bit smarter about making their own movement decisions. In line with the game's "ProActive AI" feature this year, defenders also felt more reliable, and there was a noticeable improvement in goal keeper and defender animations compared to last year's game. The AI is far from perfect however, as I continued to catch my teammates stopping in their tracks, hesitant to move into an obviously advantageous position. Still, AI is improved overall, and is good for players (like myself) that will need time to acclimate themselves to the "response defending" controls introduced this year. Tracking and holding up opponents using the right trigger and the A button is important to stopping any threats, but it's also easy to have opponents pass you by while attempting to hold them up or go for a tackle. The risk/reward of playing defense is much more imbalanced here than in recent FIFA efforts, even considering how similar the defensive game is for both series. I'm left feeling like I can't effectively play defense in PES 2013. It's painful to feel that it even warrants mentioning, but PES 2013 is at a continual disadvantage in some arenas compared to EA's juggernaut series. The series still lacks the number of licensed teams that FIFA 13 can boast, even with the addition of all 20 clubs from the Brazilian national league. While PES 2013 holds strong with a relatively impressive presentation, players felt a bit too stiff to me and the commentary was nothing impressive. To top it off, the game's feature set doesn't really compare to FIFA's offerings this year, as nothing in its career or cup modes really stands out (apart from the excellent UEFA Champions League mode). Sure, I enjoy equipping stat-boosting cleats as much as the next player, but that doesn't drive me from one game's career mode to another. The great divide between the two major soccer sims, however, is hardly about the various modes or teams available in each game. Pro Evolution Soccer fans that enjoy the series' style of play over the less-challenging FIFA series have every reason to justify their commitment this year. Pro Evolution Soccer 2013 continues the series' tradition of being the more complex soccer sim of the two options out there, which should explain its steeper learning curve for newer players. To be clear, it is a great game that offers plenty of challenge to soccer fans. Successfully executing plays in its more complicated control system, especially in trapping and dynamic one-two passing, does feel appropriately rewarding. There's definitely an appeal to the more challenging game in Pro Evolution Soccer 2013, and I happily encourage players to give it a shot. This review is based on a retail copy of the Xbox 360 version of Pro Evolution Soccer 2013, provided by Konami.